The ICOM (International Council of Museums) defines the museum as “a non-profit, permanent institution in the service of society and its development, open to the public, which acquires, conserves, researches, communicates and exhibits the tangible and intangible heritage of humanity and its environment for the purposes of education, study and enjoyment” (http://archives.icom.museum/definition.html). One of the museum’s main objectives is to communicate and exhibit its collection to the public for education. Several ways exist to communicate about the collection. The best known by the public is exhibition, permanent or temporal, where artefacts are explained via text labels and guided tours. Some studies show that people remember better when the educational content is given through a story (Rizvic et al., 2012). But as several types of public visit the exhibition, several types of content should be offered. They could be statically provided based on predefined public profiles or dynamically adapted during the visit. In the case of a museum, the content should mix education, storytelling, and adaptation. Which constraints does this imply for the content designer? Which solutions could be provided? Which one is the best? The aim of this paper is to defend a gaming and learning approach that matches the content designer’s needs. There are several ways that narrative and users influence each other. Traditionally, a narrative influences the mood of the user. Narrative can be provided by a book, movie or, more recently, mobile visit to a tourist area, with possible influence from the environment (Pittarello, 2011; Davies, 2007). For some years now, research has been conducted on the possible influence of users on narrative. Interactivity appeared first; now adaptation is of primary importance. Adaptation tends to be widely used in museum contexts, where there is a large range of visitors with content that should address each of them individually. Antoniou and Lepouras (2010) defined adaptation as the system’s ability to adapt itself to its environment or to the need of the user. For example, DiPaola and Akai (2006) proposed an adaptive multimedia system where virtual belugas behave differently upon objects that users can put on the system’s screen. Location-aware systems are also examples of systems based on environmental variables. But when the system behaviour depends on the users’ needs, it is called personalization. Visitor profiles could be predefined and remain static during the whole visit. Or they could be dynamically modified depending on the choices (Pujol et al., 2013; Kuflick et al., 2011) or the behaviour of the visitor (Antoniou & Lepouras, 2010). Several levels of adaptation exist in the system’s configuration: from user to system full control. The first end of the scale is called adaptability, the other adaptivity. Many gradients exist between them, such as in the CHESS project where the system proposes three options to a visitor. Each option is defined by the visitor’s adaptive profile; however, the visitor still has a choice of several kinds of content (Pujol et al., 2013). Adaptation could be defined by several parameters that can help to set the visitor’s profile. It could be static information like age, gender, expertise, or the time the visitor can stay in the museum. It could be contextual information like the user’s interests during the visit. These interests could depend on the visitor’s choices from the different menus s/he accessed (Pujol et al., 2013). It could be built from sensor feedback: electroencephalography, electrocardiography, skin conductance, and eye-tracking (Damala et al., 2011). It could also be defined by the visitor’s behavior in the museum (Antonious et al., 2010). In this paper, Antonious and his colleagues aimed to prove that the way visitors move in an exhibition, referred to as their style of visit, reflects their cognitive style. Tracing the way people move could then be a way to know what format of content should be proposed: short for those who just throw a glance at the artefacts, long for those who stay a long time in front of each work of art. In any event, adaptation means collecting a lot of data. Data collection becomes mandatory to define the user’s profile. The more common means are questionnaires at the beginning of the visit, direct observation of visitors and public studies (Pujol et al., 2013). But this requires that visitors take some time before the visit to answer the questionnaire. Kuflick et al. (2011) try to find a way to personalize the visit without asking for new information. 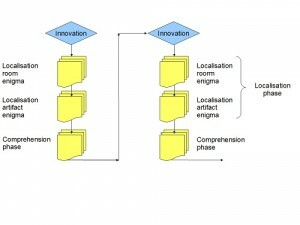 Their approach is based on log files and word matching against artefact-related content. This helps to define a content-based user model. The profile is dynamically updated during the visit with the user’s interest. It helps to choose between more general content or more targeted and detailed information. This dynamic collection during the visit is another open area of research. It should be noted that adaptation or adaptivity are not only used to adapt storytelling to the user. Sometimes it can help to predefine or adapt guided tours. Antonious and his colleagues use the style of visit to propose different routes through the museum (Antonious et al., 2010). Some others use it to propose the most accurate artworks to see, depending on the visitor’s profile (Pujol et al., 2013 ; Kuflick et al., 2011). Most academic research studies the effect of interactive storytelling on visitors. The points of view of visitors are widely different: the feeling of having learned more (Antoniou et al., 2010 ; Rizvic et al., 2012), engagement, and the feeling of presence where 100 percent of the visitors said that the digital story motivated them to explore more exhibits (Rizvic et al., 2012), but it is very rare that studies address the curator’s point of view. How adaptivity influences storytelling is barely, if ever, studied. Sometimes storytelling can be defined as a tree (Pujol et al., 2013) or follow a very linear structure (Rizvic et al., 2012). But it should be more open if we want to give more freedom to the visitor. DiPaola and Akai (2006) describe an environment where the storytelling is highly interactive. Visitors interact with a virtual environment where belugas are modelled with neuronal nets and therefore can react to stimuli coming from the real world as real belugas. As far as we know, Kuflick et al. (2011) are the first to note that such interactive mobile guides imply a lot of effort for the curators to define content. Their contribution is a nine-point inductive method to design the presentation. They advise first defining the main idea of the visit, then choosing the artefacts, defining the questions that the different type of visitors will be interested in, writing the text, choosing the images, and recording the presentation. But this does not really explain how adaptivity influences content creation. This is the aim of this article. This article will present our study in the context of pervasive applications. We will first introduce three experimentations made in the Cnam CEDRIC Lab. They revealed the challenge that curators have to face when designing a new generation of cultural content. Then we will present several solutions proposed during the three projects, and explain why one of them seems better than the others. We will then conclude. 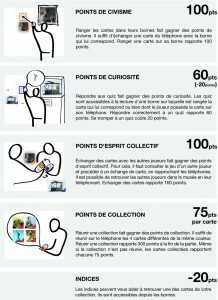 The first experiment we conducted was part of the “PLay Ubiquitous Games and play more…” (PLUG) project, funded by the French National Research Agency (ANR) and CapDigital, a French competitiveness cluster (http://plug.cnam.fr/xwiki/bin/view/PLUG/WebHome). The purpose of this project was to design pervasive serious games to help in visiting museums. Pervasive games are games integrating the player’s environment into the game play. They mix the game’s world and reality. Serious games are games that integrate another objective than strictly play. In a museum, the aim of a serious game is to deliver educational content as well as let people play and thus enjoy their visit in a different way. Two pervasive serious games came from the project, each of them with a different adaptive process. The first game, “PLUG, the secret of the museum” (PSM), was designed to lead the visitors through the whole museum space, to visit each gallery, and to learn about specific artefacts. It was designed as a virtual card game with sixteen cards figuring sixteen artefacts. At the beginning of each play session, players received four different cards that they had to exchange to recreate one of the four predefined families. They could exchange cards with other players or on a specific kiosk near the artefacts. Each exchange and answering the quiz earned points. The player with the greatest number of points was the winner of the session (fifty-five minutes) (Astic et al., 2011). This game was very successful, especially with families. One of the reasons was that adaptivity was defined in the rules. There was a game design mapping between rules and psychological skills (Figure 1): when a player was exploring or answering a quiz, it meant that he was curious; when he exchanged cards with another team, he demonstrated sharing skills; and when he put the right card on the kiosk near the artefact figured on the card, he showed a civic-minded attitude. Thus, everyone could play depending on his profile. But learning and playing were not balanced enough in PSM: players did not take time to answer quizzes and learn about artefacts. The second game, called “PLUG, ParisOvernightUniversity” (PPOU), was designed to alleviate this drawback. The learning message was put at the core of the game and really structured it. The learning objective was to reveal the extraordinary connections that linked discoveries to lead to an invention. The game was designed as a treasure hunt, with four quests and a final scene. Each quest concerned one artefact and was designed in two steps. The first one was to find out the artefact, the second was about understanding its physical or technical principles. This second phase was called the “understanding phase” (Figure 2). It helped players to see the relationship among the four artefacts. This relationship had to be explained to the designers during the final scene, conceived as a memoir defense. Designers could then know if the learning message was well understood. It also gave an opportunity to explain it to the players if needed. PPOU was designed for a very large public, not only players with a scientific background. Thus, an adaptive process was defined in the “understanding phase.” Each question (“enigma”) was defined on three levels: difficult, medium, and easy. The system dynamically switched from a level to another. It depended on the time players spent answering questions (seven minutes). At the beginning of the game, all players received difficult content. Then the system adapted the level to an easier one until the level becomes sustainable for the visitors/players. At the beginning of the next “understanding phase,” the system proposed content with a level just above than the last. For example, if the player stopped with the easy level, then the next “understanding phase” started with a medium-level question. The third experimentation was the ARtSENSE project (http://www.artsense.eu). It was funded by the European Commission. Its aim was to design an adaptive augmented reality tour. Visitors wore glasses with an eye-tracker and biosensors. Monitoring these allowed the system to know if the visitor was interested or not by an artefact. The system could then dynamically decide what piece of content could be proposed to the visitor (Figure 3). Each narrative element was chosen among a predefined tree of contents. The adaptive processes of these three experimentations were quite different. As said, in a museum, a guided tour is, most of the time, a story that you told your visitor, as well as educational and cultural content. This implies that the process of adaptive content creation should take care of two other components: storytelling and learning. However, adaptivity impacts the story differently, depending on its implementation. In PSM, adaptivity was defined into the rules. Thus, no relationship existed between the cultural content and adaptivity. In PPOU, the content needed to be defined in three levels. When the player unlocked the “understanding phase,” a question of a specific level was proposed to him. If he did not answer the question within seven minutes, a question of a lower level was offered. So a dependency existed between each level: each lower level should enlighten the upper level, but without redundancy. In ARtSENSE, the length of the narrative element depended on the sensors’ sampling frequency. Every five seconds, the sensors returned an evaluation of the visitor’s interest. If the interest changed in an obvious way, the system proposed another topic. If not, it detailed the current one. Thus content creation was a real challenge. Each narrative element should be five seconds long and an invitation to hear more. But it should also be self-contained, because the visitor could change his mind and decide to skip to another topic. In this case, this five seconds of content will be the only content that the visitor will hear on that subject (Damala et al., 2013). Looking at these three experimentations, we could say that adaptivity more often means splitting content into self-contained elements so visitors can zap from one element of content to another. What is the impact on learning? 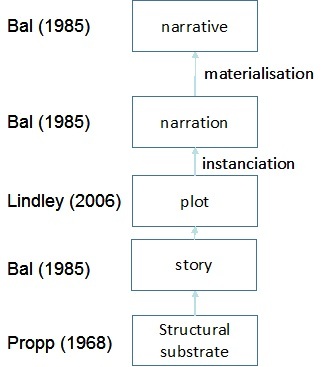 Craig Lindley modeled the creation process of narrative (Lindley, 2005). His paper gives us some clues to understand the relationship between storytelling and learning. His approach was rooted in works from Mieke Bal (Bal, 1985) and Vladimir Propp (see Figure 4). The first level is the story elements: the characters, the events. Then, Bal formalized storytelling in three steps. First is the “story” that gathers all the events and characters presented in chronological order. However, the narrator can order this event as s/he likes when s/he tells the story. S/he then creates what Bal called the “narrative.” This narrative is materialized into a book, a novel, a movie, a comic, and so on. It is the third level, the “narrative.” However, according to Lindley, another level exists between the story level and the narrative level. There, the storyteller chooses the elements that will structure his “story.” This reordering defines the transition from the “story” into the “narrative.” These enlighted events or characters are called the “plots,” giving their name to the “plot” level. 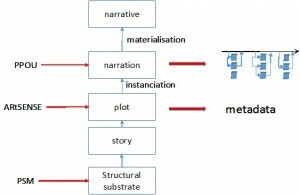 Thus, narrative is a plot level’s instantiation according to some order. Depending on this order, the narrative is more or less understandable. Plots combined in any random order can instantiate meaningless narration. In the case of a museum, guided tours and serious games are two examples of learning experiences depending on the narrative. According to Lindley, this narrative is defined as an ordered association of contents elements or of contents elements and games events. If these “plots” are played in any order, the visitor could miss the learning message. Thus, this order is of prior importance. So content designers, as curators for example, face a real challenge when creating educational content for adaptive applications, whatever they are: guided visits or serious games. On one hand, adaptivity forces the creation of a narrative split into self-contained pieces of content with possible dependency and no predefined order; on the other hand, learning requires consistency through ordered pieces of content. How, then, to balance consistency and adaptivity? How to sustain a learning experience? The CEDRIC experiments proposed examples of three possible solutions. First, game and content designers choose to create a strictly ordered narrative, limiting the adaptivity to a small sequence of the narrative. For example, PPOU had a very strong linear narrative. 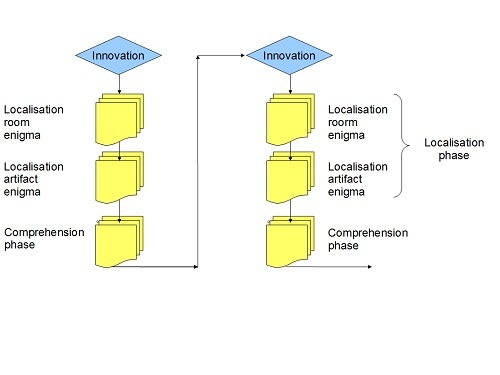 However, adaptivity was included in the narrative level, plugged only into a sequence of the narrative (the “understanding phase”) (see Figure 5). A visitor started with the linear narrative. Each time he entered an “understanding phase,” he began an adaptive sequence. Adaptivity ended at the end of this “understanding phase,” and the visitor came back to the linear narrative. However, in such a solution, visitors/players do not have a lot of choices to progress in the game. Their freedom is limited, decreasing their game’s quality of experience. They risk losing the game’s immersion challenge. In PPOU, this was counterbalanced by a strong immersive story, favoured by actors and surprises, that did not disturb the learning experience. A second solution could be to lightly structure the disorder, by creating, for example, a leafy content tree: each junction of the contents’ tree opens on several other contents. For example, in ARtSENSE, the curators organised the pieces of cultural content topic by topic. Each topic was linked to each other. This defined all the possible existing paths through the content. Depending on the visitor’s interest, the adaptive system proposed several contents, and the visitor selected one of them. So, here, adaptivity was defined at the plot level, where the plots were the pieces of content. No order was defined among them. The narrative was created dynamically from the visitor’s interests. With a versatile visitor, the risk was creating a meaningless visit. To avoid this drawback, ARtSENSE’s solution was to associate metadata with each piece of content, defining then a tree of content. It defined a valuable order among the plots and helped to give meaningful recommendations to the visitor. In these two first solutions, adaptivity influenced the choice of the cultural content proposed to the visitor. The third solution, on the contrary, separates adaptivity and content. In PSM, the educational content was involved into the quiz and the focus on each artefact. Adaptivity was defined in the rules: depending on his or her profile, a player chose to play as a curious individual, as a collaborative playmate or with a civic attitude. In fact, PSM introduced adaptivity into the “structural substrate” of the game’s narrative. PSM is what we call a game of emergence. For Jesper Juul (Juul, 2005), this kind of game is “specified as a small number of rules that combined and yield large numbers of game variations, which the players then design strategies for dealing with.” Chess is a well-known example of game of emergence. In an emergent game, the narrative is made of all the actions the player took in the game, all the emotion and surprises, all the answers s/he gave to questions. The player defines the plots and orders them into his or her own narrative. The quality of the learning experience depends here on the place the player gives to educational content. The right balance of the game’s rules should incite him or her to make the good choices. Games of emergence, and especially pervasive transmedia serious games of emergence (PTSGE), could to be a solution to our problem. As we said, pervasive games are games integrating the player’s environment into the gameplay. For example, PSM and PPOU were pervasive games, as their content relied on the player’s location. To give the educational content at the right time in the right place is important for museums. Transmedia games are games with a story that “unfolds across multiple media platforms with each new text making a distinctive valuable contribution to the whole” (Jenkins, 2006). What Jenkins means by “text” here is piece of information, whatever is the media that supports this information. A typical example of transmedia storytelling is The Matrix franchise, where the story was built with elements coming from the movies but also from the game or the cartoons. Cartoons developed secondary characters that enriched the movies’ universe. Henri Jenkins notes also that, with the massive use of social networks and ICT, transmedia implies public participation. Eric Viennot, the famous transmedia game designer, confirmed that the fans are not the passive spectators they were in the past. They could be source of new directions, and even could continue the game after its scheduled end (Mal, 2013). In a certain manner, museums are already transmedia: in the exhibition, artefacts are the first sources of knowledge. Then the labels give more information (author, date, length, its provenance, and some explanation on its significance). Sometimes, a small movie could explain a technical point or the context of the creation. Comparing one artefact to the others is also a way to understand its meaning. Outside the museum, the website, the museum social networks, catalogues, dedicated books, or TV documentaries complete the artefact’s discovery. Thus, PTSGE could foster this transmedia characteristic of museums. Their pervasiveness helps visitors to discover and use, in situ and at the right moment, all these pieces of content that, usually, in fact, they hardly ever use in combination. Further, they could enter and play the game using the media they liked, or discovering new ones. Transmedia characteristics foster the adaptivity created by emergence. Emergence gives the objective and the resources to meet this objective, but it is the player’s role to define the way to achieve his or her aim. Free progression always carries out several inquiries, and the player needs to test different approaches to find the way to the game’s end. Because the player’s action is the answer to her or his own question, the player is more attentive to its result and can learn from it. S/he also creates his or her own narrative through the museum and its different messages. As David Schaller reported (Schaller, 2011), this process of trial and error is seen as “a core value of the games” by educational scholars. In addition, PTSGE are replayable. As in chess, you can play several sessions, choosing different options, and never be bored. This feature is important for a museum. Games are expected to be an opportunity to transform first-time visitors into regular visitors. But museums have not expected to participate in further development. Creating content for adaptive applications, and especially for pervasive transmedia serious games, is tricky. Adaptivity implies creating self-contained pieces of content. Most of the time, this content should be combined according to the visitor’s characteristics, but it should also create a meaningful narrative, especially in the case of educational applications. Pervasive transmedia serious games of emergence seem a way to encounter this problem. Their pervasive and transmedia features suit museums perfectly. Also, their content does not structure the game. The content is one of the resources of the game and has no relationship with adaptivity. But special attention is required to define the rules. They should absolutely take their roots into the educational message. Pervasive transmedia serious games are dependent on their environment and take into account, and emphasize if possible, the transmedia characteristics of museums. But they are also appropriate for smart cities. Elisabeth Bonsignore and her colleagues remarked that alternate reality games are well suited for twenty-first-century literacies (Bonsignore et al., 2011). It is the same for PTSGE: players learn to gather and manage data, to use data to solve problems or create new solutions. As they are fully collaborative, these games also teach respect for other players and how to collaborate with them. Data already surrounds us, so all these skills are the ones needed for the twenty-first century. Pervasive transmedia serious games are therefore a new media to learn smart cities, smart citizenship, and civic-minded attitudes. Huizinga (1951) and Callois (1967) said that games are at the origin of culture. So maybe we can see pervasive transmedia serious games as a sign of the rise of a new culture: a “smart” culture? Antoniou A., & G. Lepouras. (2010). “Modeling visitors’ profiles: A study to investigate adaptation aspects for museum learning technologies.” J. Comput. Cult. Herit. 3(2), Article 7 (October), 19 pages. Bal, M. (1985). 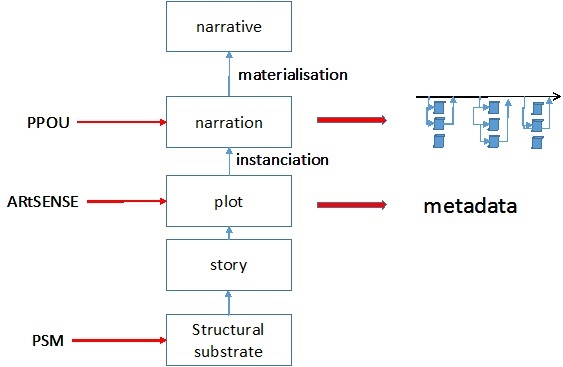 Narratology, Introduction to the Theory of Narrative. University of Toronto Press. Caillois, R. (1967). Les jeux et les hommes, le masques et le vertige. Editions Gallimard. Damala, A., I. Astic, S. Rovedakis, & E. Gressier-Soudan. (2013) “La Réalité augmentée adaptative, vers une nouvelle expérience de visite au musée,” In H2PTM 2013 proceedings: Pratiques et Usages Numériques, Conservatoire national des arts et métiers, Paris, France, October 2013, 205-220. Damala, A., & N. Stojanovic. (2012) “Tailoring the Adaptive Augmented Reality (A2R) museum visit: Identifying Cultural Heritage professionals’ motivations and needs.” International Symposium on Mixed and Augmented Reality 2012 (ISMAR 2012), Arts, Media and Humanities track, November 5-8, 2012, Atlanta, USA, pp.71,80. Davies, H. (2007). “Place as media in pervasive games.” In Proceedings of the 4th Australasian conference on Interactive entertainment (IE ’07). RMIT University, Melbourne, Australia, Article 7, 4 pages. DiPaola, S, & C. Akai. (2006). “Designing an adaptive multimedia interactive to support shared learning experiences.” In ACM SIGGRAPH 2006 Educators program (SIGGRAPH ’06). ACM, New York, NY, USA, Article 14. Huizinga, J. (1951). Homo ludens: Essai sur la fonction sociale du jeu. Editions Gallimard. Jenkins, H. (2006). Convergence Culture, where old and new media collide. New York University Press. Juul, J. (2005). Half Real: Video Games between Real Rules and Fictional Worlds.The MIT Press, 248p. Kuflik, T., O. Stock, M. Zancanaro, A. Gorfinkel, S. Jbara, S. Kats, J. Sheidin, & N. Kashtan. (2011). “A visitor’s guide in an active museum: Presentations, communications, and reflection.” J. Comput. Cult. Herit. 3, 3, Article 11. February 2011, 25 pages. Lindley, C.A. (2005). “Story and Narrative Structures in Computer Games.” In Bushoff, Brunhild (ed.). Developing Interactive Narrative Content: sagas/sagasnet reader. Munich: High Text. Pittarello, F. (2011). “Designing a context-aware architecture for emotionally engaging mobile storytelling.” In Pedro Campos, Nuno Nunes, Nicholas Graham, Joaquim Jorge, and Philippe Palanque (eds.). Proceedings of the 13th IFIP TC 13 international conference on Human-computer interaction – Volume Part I (INTERACT’11). Berlin, Heidelberg: Springer-Verlag,144-151. Pujol, L., A. Katifori, M. Vayanou, M. Roussou, M. Karvounis, M. Kyriakidi, S. Eleftheratou, & Y.E. Ioannidis. (2013). “From personalization to adaptivity – Creating immersive visits through interactive digital storytelling at the Acropolis Museum.” In Juan A. Botía and Dimitris Charitos (Eds. ), Intelligent Environments Workshops, (17): 541-554 IOS Press. Rizvic, S., A. Sadzak, V. Hulusic, & A. Karahasanovic. (2012). “Interactive digital storytelling in the sarajevo survival tools virtual environment.” In Proceedings of the 28th Spring Conference on Computer Graphics (SCCG ’12). ACM, New York, NY, USA, 109-116. I. Astic, Storytelling, learning, and adaptivity: A difficult mixing. In Museums and the Web 2013, N. Proctor & R. Cherry (eds). Silver Spring, MD: Museums and the Web. Published May 31, 2014. Consulted .